This is a modificiation that taps in to the X-10 DS-7000 to allow any X-10 device that can by controlled by a KR19A Keychain Remote and many other X-10 remotes to be controlled by any of the 12 status LED's in the DS-7000 (Power, Low Batt, Zones 1-8, Record, and Armed). This can also be done if you have Active Home Pro Software, PC Interface, OnAlert, and Maco Software, as well as a computer you are willing to run 24x7x365. The cost of this mod not counting time, is under $20 and does not require anything but a DS-7000 and the Relay Control Circuit described here. On the other hand, it can augment the AHP by triggering phantom or real module macro's run in the X-10 Computer Interface, and add functions OnAlert does not currently have. Since this operates a pair of relays, it can also be used for anything a SPST, Normally Open, relay could trigger, just note that the relay only stays closed per event for 1/4 second, this was to simulate someone pushing a button on a remote control. If you need the relay to stay close shorter or longer you can adjust the value of C4 to suit your need. Basic Mod Operation, DS-7000 LED comes on, Relay 1 is closed for 1/4 second then opens. When the same LED goes off, Relay 2 closes for 1/4 second and then opens. If the LED you are using is the ARMED LED and the alarmed is triggered in Armed mode, then relays will ignore the flashing and consider the LED to still be on. I am using it to power on my camera and recording system only when the DS-7000 is armed. You can read much more detail in another post when this was just an idea, it is now real so I thought I would post it now for anyone who can read a schematic, solder, and such, the circuit in the link below has been tested and works, so you don't have to wait for the detailed instructions if you want to make one of your own now, I added the parts list at the end. For those who might want to use this modification but don't know much or anything about electronics I will post detailed, step-by-step instructions within a month or so (good docs take time), but with these instructions all you will need to know is how to solder and use X-10 products. Unplug the DS-7000 and run it off the 9V battery for all of this!!! Just a few of notes: (For those who don't want to wait for detailed instructions, read all first, I tried to put them in logical order by did not really proof the order well, this is for folks who are pretty handy with electronics to start...) When you take the cover off the DS-7000, also remove the earphone jack, cover it with tape so as it flops around it will not short out anything). This will void your DS-7000 Warranty as well as any X-10 remote you wire it to! 1. To get the +5VDC from the DS-7000 that is live plugged in (120VAC) and on battery, take it from the PCB jumper below the label R111 and next to the label R23, it also says +5 next to it. Tin a spot in the middle of jumper, tin your power wire (use red for + and black for -) Tin your power wire ends, and solder it to the jumper. 2. To get Circuit ground grab it from the jumper with the label R23 at the top. There are plenty of places you can get the +5 and Ground, these were just in a good spot for where I plan to put the mod. 4. As you take the indicator panel off the DS-7000 all kinds of stuff is going to fall out or come loose, don't worry, just don't lose any of it, that will be: the house & Unit dials. the color (red/black) rings around the dials, the 3 white buttons (Record, Arm, Bypass), the slider switch lever (Install, Run 1, Run2), a very thick piece of paper that goes between the top of the slider switch and the case, and the keypad membrane. 5. While Experimenting, you don't need the House and Unit dials, it defaults to A1, but you will need the switch slider, just look at how it was oriented (it is easy to tell), and hold it against the PCB in the Install position to install a Remote like the SH624, and one motion detector or door/window detector to trigger the alarm with, same deal, hold the switch slider in the Install position, press Test on the module you picked, remove the slider, it will automatically go back to Run 1. 6. Do all your work with just the 9V battery, don't have the DS-7000 plugged in, so also remember when not working on it to remove the battery, it goes dead in less than a day. 7. If you use the KR19A remote like I did, open it up like you would to replace the battery, remove the battery, then gently pull the PCB from the case. Pull off but button membrane, you will see where the on/off buttons would touch. 9. Tin those three spots, make sure not to keep the soldering iron on any given spot for long, just enough to leave a little spot (ball) of solder. 10. You will need to solder on 3 wires, one is common to both ON/OFF, one is to ON, and the Other is to Off. Tin the ends of all three wires. 11. If you plan to also use the second ON/OFF buttons, repeat steps 8-10. 12. Solder your wires to the remote control. 13. Solder a 330 (red red brown) or 390 (red white brown) Ohm resistor to the positive Battery terminal on the KR19A. 14. Solder a red (+5VDC) wire to the other end of the resistor. 15. Solder a black (ground) wire to the negative terminal on the KR19A. 17. Solder a Momentary (Normally Open) small Push Button switch across each Relay Set of contacts, this will allow you to program any House and Unit Code you want the remote to send. Have enough wire to mount them in the DS-7000 Case or if external to the DE-7000 to go far enoough. 21. Remove the 9V batter from your DS-7000. 22. Attach your power wires from the DS-7000 to the relay control board. 23. Attach your power wires from the KR19A to the DS-7000 at the same place. 24. Attach your trigger/signal wire from the DS-7000 to the relay control board. 25. Solder on your control wires from the KR19A to the relays on the relay control board. 26. Put the DS-7000 9V battery back in and repeat step 5. 27. Test the remote functions by pressing ON momentary switch and see something set to A1 comes On, same for Off. Then test programming the KR19A for another house and unit code, repeat the on/off test. 28. If you used "Armed", then Arm the DS-7000, a module that you have set to the KR19A Code should go on. 29. If you used "Armed" then DisArm the DS-7000, a module that you have set to the KR19A Code should go off. 31. With the DS-7000 plugged in, remove the battery, repeat all tests. 32. Unplug the DS-7000, keep battery removed. 33. Carefully put the House and Unit code dials, with the color rings back on the cover (it is all keyed so it is easy). 35. Put the Slider switch back in, it is also keyed so as to only fit right one way. 36. Put the 3 white buttons back in. 37. Put the Keypad Membrane back in, it is keyed also. 38. Put the DS-7000 Indicator/Control PCB back and secure it with the same screws. Secure that section back to the DS-7000 Top cover, use the same screws. 39. Test that the slider slides, the House and Unit rotate, and white buttons push. 40. Put the earphone jack back. 41. Put the top back on the DS-7000, user the same screws. 3 - Colors of 14g wire, to keep your sanity, you can use more colors if you want. For those who can't read a schematic, don't even bother to try this until I post the Instructions on how to Assemble. And for everyone, remember, your DS-7000 and KR-19A warranty is toast as soon as you crack the cover. Sometime in a month or so I will put together the detailed instructions, with pictures, step by step stuff, how to tell the ends of things that matter like diodes, chips, and transistors... As well as links to the data sheets on all parts, a link to basic soldering instructions, the works. Good docs take a while so if I slip that month time frame target, just know it was to improve your chances of success with the least worry. Unlike the instructions above, I will assume you don't know anything about electronics. Hobby kits are almost always "rated". 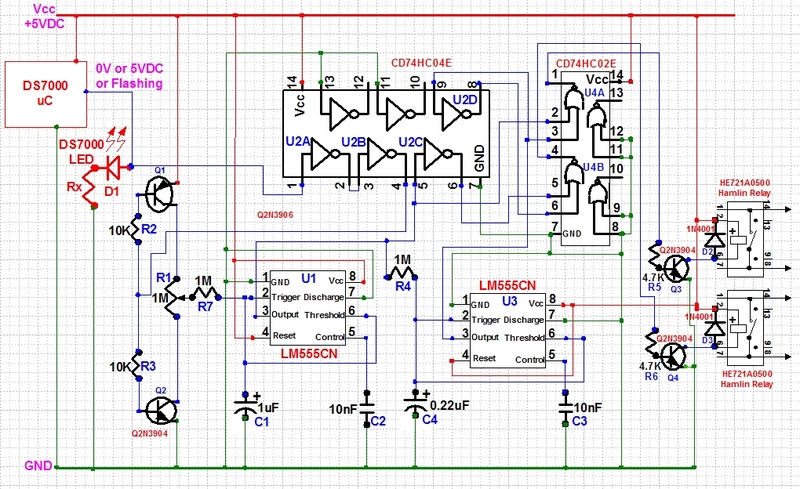 This would be rated as "Medium to High Complexity" only because of the number of steps, I will remove all electronics complexity aspects but there is no way to reduce the steps, the above steps are the key steps, in the detailed plan there will be many more as I will cover how to tell which end of a part goes where, or what the pins are on a transistor or chip. Disclaimer: I take no responsibility for any thing you might break or fry, nor for any physical harm you may get in doing this. I redesigned the board and cut the parts count in 1/2, put it on a PCB, and installed it in my DS7000, it is working perfectly. Since this is still a fairly comlex project that involves soldering, tearing apart a Protestor Plus, and wiring in a Key Chain remote I suspect from the lack of replies, that even with less parts there is not a big demand for this so I am going to hold off on detailed instructions since it takes a lot of work to do that. If there is an interest in making on of these, please just drop me a note on the forum. What an awesome mod. I just now got around to reading it. Trust me, your efforts are well appreciated! But doesn't Active home pro have the ability to give the armed status of the DS7000? The little house in the bottom left of AHP, ( next to where you see the timers and macro bar when downloading the into memory), is supposed to show the status of the alarm system as I read it, and is where I have a question about how to keep it more up to date? If there is no way then YES, I want to know more about this circuit and will ask when and if my question has not been answered here. I think I posted this right and the beer hasn't blurred my vision! But about my question, any thoughts?